iOS 8 isn't a facelift like last year's update, but new messaging features and third-party extensions for keyboards and Touch ID make iPhone and iPad easier to use than ever. The best has yet to come, with Mac OS X Yosemite promising even better integration next month. Update: iOS 8.1.3 is available to download. 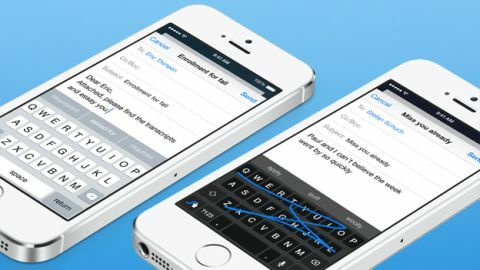 Our iOS 8 review reflects the bug fixes that solve many of the launch problems. There's a lot more to iOS 8 than meets the iPhone. Sure, it doesn't usher in a dramatic new look like last year's mobile operating system makeover from Apple. Instead, it rounds out that flat iOS 7 redesign with less obvious, but equally important extra features. These new features are more bug-free now that iOS 8.1.3 has launched. It's a worthwhile 247MB download that fixes some of the Wi-Fi and battery drain problems a users have experienced. iOS 8.1.3 isn't alone. Since iOS 8.1, Apple's operating system update has coupled with the debut of Apple Pay and cross-compatible OS X Yosemite features. It's free to download and install iOS 8.1.3, whether or not you're upgrading to iPhone 6 and iPhone 6 Plus for their larger displays. Apple has made the update compatible with iPhone 4S and later, iPad 2 and later, both iPad mini and iPad mini 2 and iPod touch 5th generation. In fact, the iOS 8 compatibility list only severs ties with the now-four-year-old iPhone 4. Broad legacy device support is complemented by this year's overarching theme of "convergence." In addition to iOS 8 bringing tighter Mac integration, it welcomes third-party extensions into the fold, even going as far as loosening its grip on allowing developers to use the Touch ID fingerprint sensor. Apple's roadmap continues to tie everything together among its iPhone, iPad and Macs devices now that iOS 8.1 and OS X Yosemite have launched. It's better than the cross-platform ideas Google has so far envisioned for its Android Lollipop update that launched alongside the Nexus 6 and Nexus 9. The latest version of the iPhone and iPad software, but it's hardly the first bug-fixing patch that Apple has attempted in the last six months, and that has to be noted in this review. On its face, iOS 8.0.1 integrated data from third-party fitness-focused apps into Apple's Heath app. But it was far from smooth, and iOS 8.0.2 only partially fixed the problems. Touch ID, cellular, SIM card, Wi-Fi and battery drain issues sent downloaders downgrading to iOS 7 and all of the negative attention actually hurt the adoption rate. iOS 8.1.3, the latest update, does the internal storage issues, though there are still lingering Wi-Fi and Bluetooth connectivity issues that people will never stop complaining about. The good news is that iOS 8 is a worthy upgrade beyond its initial rough edges. iOS 8 looks and feels the same on its surface, as Apple didn't change the way the homescreen functions. However, almost every menu within has design tweaks that make your iPhone and iPad snappier to use. Double tapping the home button, for example, sends multitasking into overdrive. In addition to its usual swiping through open apps, the top of the screen now features circular profile photos of your most recent contacts. Swiping to the left lists your favorites in the same setup. This is great for quickly making calls, sending texts and starting FaceTime chats with the most important people in your life. No more digging through the contacts or phone menu anymore. Spotlight serves a better purpose in iOS 8. It now considers broader sources of data including Wikipedia, the news, movie showtimes and suggested websites. It understands your context and location when doing this, which means Apple is taking one aspect of Google Now. Calling or navigating to the local pizza shop is as easy as typing in its name. More time-savers come in the form of interactive notifications at the top of the screen. Swiping down on an incoming message gave me the chance to respond without leaving my current app. This applied to SMS, emails, Facebook and Twitter messages. Even quicker is the way to reply to calendar invites via simple accept or decline buttons. Checking off or snoozing reminders, retweeting or favoriting tweets and trashing or marking as read emails received the same treatment. By actually opening up that Messages app, you'll find more more ways to communicate than before. The messages text box is now flanked by a camera and a microphone icon. The camera icon on the left we've seen before - it previously attached photos to messages. It still does that, but it also does some new tricks. Holding the icon down reveals a menu overlay that enables quick selfies via the front camera and take video. It's faster to send photos and videos than Snapchat, and though it doesn't have the goofy photo editing perks, it's all integrated into the conversation. The new microphone icon on the right isn't for dictation. That's still cramping the spacebar in the bottom left corner of the keyboard. Instead, it opens up a similar menu overlay in which you can record audio messages. Again, it's fast to send and the person doesn't have to load a separate app or player in order to listen. It all happens in-line with the new Messages. You can also share your real-time location in the middle of a Message conversation. This has to be my favorite new addition to iOS 8. I put this to use over the weekend when I arrived at an amphitheater for a comedy tour overrun by 15,000 attendees. I beamed a snapshot of my location to friends without having to randomly describe my surroundings. The map pinpointed where I was at, all from the Messages app. Your can also share your roaming location for a set period of time: one hour, until the end of the day and indefinitely. It's easier to use than the similar Find My Friends app because there's no setup or separate login screen required. Apple is one step closer to eliminating the pointless "Where are you at? Wait, which street corner?" and I couldn't be happier. Rounding out the iOS 8 changes to Messages, the new "details" button in the top right corner of conversations replaces "contact" and it's littered with new options. You can set individual and group conversations to "Do Not Disturb" and rifle through attachments including every last photo you've sent someone and they've sent you. Just make sure to delete inappropriate pics before showing off this cool, new feature to mom and dad.